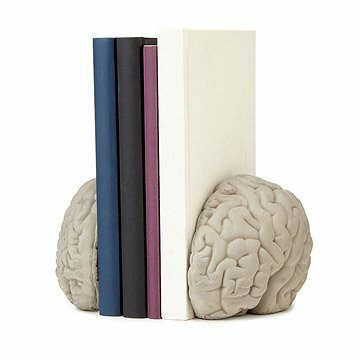 Watch your mind expand as your hardcover collection grows with this set of brainy bookends. Watch your mind expand as your hardcover collection grows with this set of smart bookends. Designed with logical left and creative right brains in mind, this cerebral concrete decor holds your storied classics and soon-to-be-favorites, keeping your knowledge right where you can see it. Made in China. 6.3" L x 5.3" W x 4.5" H; 4.8 lbs. Real authentic looking and heavy! This is a great gift for any doctor and ones planning to become a doctor. Got it as a thank you gift, but am tempted to order one for myself. This was the perfect gift for the occasion. My sister was just thrilled. Perfect bookends for my medical book collection! These are the perfect bookends to display with my medical and scientific book collection. They are functional and look great. They are impressively detailed and realistic! Got this as a Valentine's gift for my husband. He is in the mental health field and this was perfect for him! These are in his office and they look great. This was a perfect gift for our son, the psychiatrist. He is setting up his office and this is just what we were looking for. It was made of concrete so nicely weighted, but the detail quality was poor and unfinished. The reason I purchased the Gray Matters Right Brain Left Brain Book stands was it was perfect for my granddaughter, a new college graduate. She is going on to get her doctorate in neuro science. It seemed like a fun gift and appropriate to her interests.